Send A Message To Elyssa. Elyssa’s experience and area of concentration includes working with individuals and families who are struggling with substance use, grief, anxiety, depression, and traumatic experiences. Recognizing the connection between people and the environment in which they live is essential to Elyssa’s practice. Elyssa is available to work with individuals, couples and families, and she offers a flexible schedule when needed. Elyssa was raised on Vancouver Island and now considers Kamloops home after settling in 14 years ago. She began working in the social service sector in 2006 while completing a Bachelor’s degree in psychology. 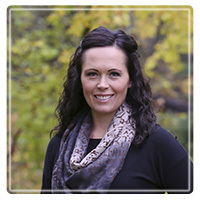 Elyssa now holds a Master’s degree and is a Registered Clinical Counsellor with the British Columbia Association of Clinical Counsellors and is a Certified Substance Use Counsellor with the Justice Institute of British Columbia. Elyssa is actively involved in research initiatives focusing on occupational stress in high risk occupations such as first responders, corrections staff, and hospital workers. It is a priority for Elyssa to understand the unique challenges that are faced by people in these occupations and to implement these understandings into her practice. Elyssa uses a Response-based framework as a foundation for her work with people, which means that she is always considering their interactions, behaviours, social worlds and biology. She believes that we are all social creatures and therefore we are responding to the people and situations that are being presented to us. Elyssa believes that we all need support at times to recognize that even our most understandable thoughts and behaviours can, in some ways, be harming or hurting us. Additionally, Elyssa provides a non-judgemental and caring style of counselling for every person that enters the office. Elyssa is also trained in Dialectical Behaviour Therapy, which includes practical skills and mindfulness as a platform for safely working through difficult experiences and situations.